A Scooby Doo tale and a Mystery Puzzle all in one! 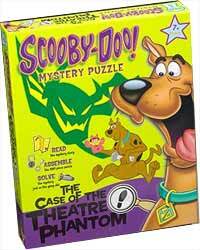 Read the gripping tale which sets the scene for the adventure in these Scooby Doo puzzles. Assemble the 250 piece jigsaw –this will need some sleuthing as there is no picture for reference! Once you have done this, you can solve the Case of the Theatre Phantom as all clues are in the puzzle. You can check the solution by holding the back of the booklet up to a mirror…but no peeking!